justthefood.com...the blog: Vegan MoFo 2013: It's Crunch Time! We are coming pretty close to the middle of MoFo so that means crunch time. Time to get remotivated and keep the energy up. Time to get reinspired by other blogs and refocused on the task at hand. 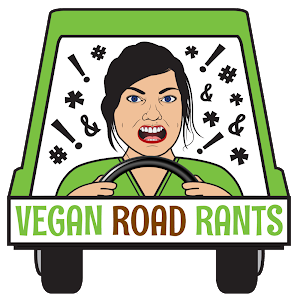 And that is spreading the good word about vegan food! 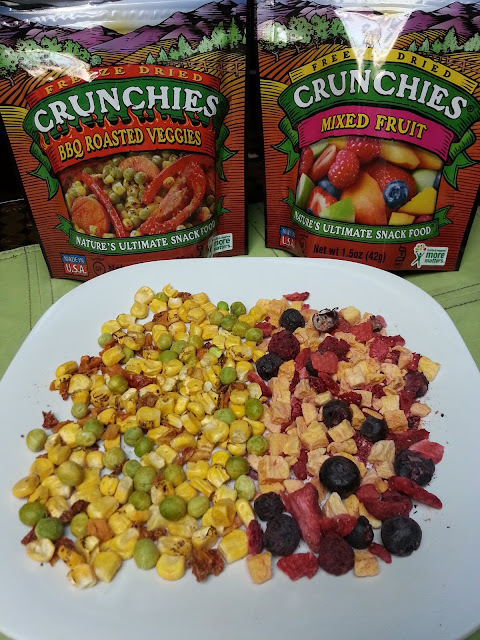 The fine folks over at Crunchies Food Company were kind enough to send me a few samples of their freeze dried fruits and veggies. I am no stranger to freeze dried foods, but these ones were really, really crispy and, well, CRUNCHY! Other brands I have tried get kind of soggy once you open the pack, but these ones stayed nice and crisp for over a week once they were opened. I will admit to never snacking on freeze dried veggies before, so that was a nice change of pace. The BBQ Roasted Veggies made a great snack. Not too salty and just the right blend of spices. They offer lots of flavors of both the fruits and he veggies. 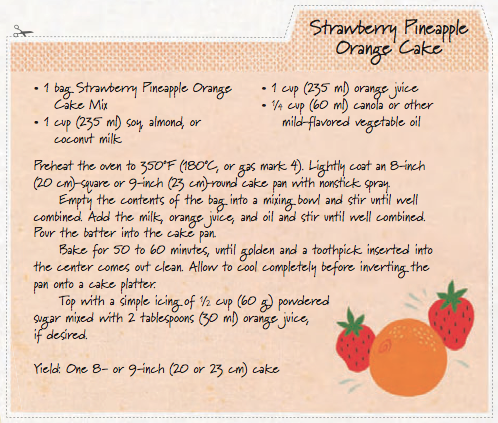 The ingredients are so awesome, just fruits and veggies! (And spices if it's a flavored mix.) ANd you can't get cleaner than that. They do offer a few organic varieties, but please use caution when picking these up, as some flavors are not vegan, like the Sweet Buttered Corn which has real butter in it. But other than snacking, what else do you do with freeze dried fruits and veggies? Me? I cook and bake with them. The freeze dried blueberries are perfect for blueberry pancakes and muffins, and the strawberries are awesome in muffins and cookies. I also add them into dry mixes for gifts. Here is a recipe from Vegan Food Gifts that uses these freeze dried fruits perfectly. Into a clear cello bag, layer the ingredients in the order listed above. Tie closed with a pretty ribbon or twine, and attach the recipe card below. Lightly coat an 8-inch (20 cm) square or 9-inch (23 cm) round cake pan with nonstick spray. Empty entire contents of mix into large mixing bowl. Add milk, orange juice, and oil. Bake 50 to 60 minutes, until golden and a toothpick inserted into the center comes out clean. Allow to cool completely before inverting from pan onto cake platter. Add a simple icing of powdered sugar mixed with orange juice if desired. On a side note, today's post is the 500th post here on JustTheFood. How cool is that? 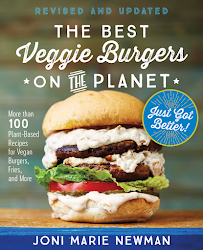 500 posts about nothing but vegan goodness. Enter to win a Crunchies Prize Pack by following the prompts in the widget below. Unfortunately, since I will be shipping food, this contest is only open to residents of US and Canada. Sorry guys, thems the rules. I've had freeze dried apples...we used to snack on them as kids. I didn't realize there was such a variety...Freeze Dried Grilled Edamame with Wild Rice? Sounds superyumful! I've had the freeze dried strawberries, and just ate them as snacks. I've only had freeze dried pineapple. It was super sweet! I ate it just as a snack. Congrats on your 500th!! I have some freeze-dried fruits, but I am saving them for emergency! I would like to try these just to snack on. I do think that organic berries would be great for my morning porridge. My son *loves* Crunchies, he can eat a whole bag in one sitting! I usually just snack on them straight out of the bag. I have never tried freeze dried fruits and veggies in cooking, but would love to try it! No, I have actually never tried them, but I did buy 2 blueberry bags and 1 strawberry bag at MEC this summer. I just haven't tried them yet. I also got some freeze-dried pineapple chuncks from the Vegan Cuts snack box. I want to try a drink recipe from Vegan Yum Yum. Freeze dried strawberries in my bran flakes = pure heaven. I love freeze dried fruits and veggies! But they are SO expensive--especially the Crunchies brand. I would love to win some! What an awesome giveaway. Thank you for the opportunity! I bring freeze dried veggies on hiking trips! 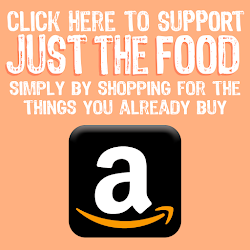 I've only used freeze dried fruit as a snack- but now, with the recie above (and my own handy copy of Vegan Food Gifts!) I think there are new adventures agead! Yes I have had freeze dried fruit for a quick snack during the day. 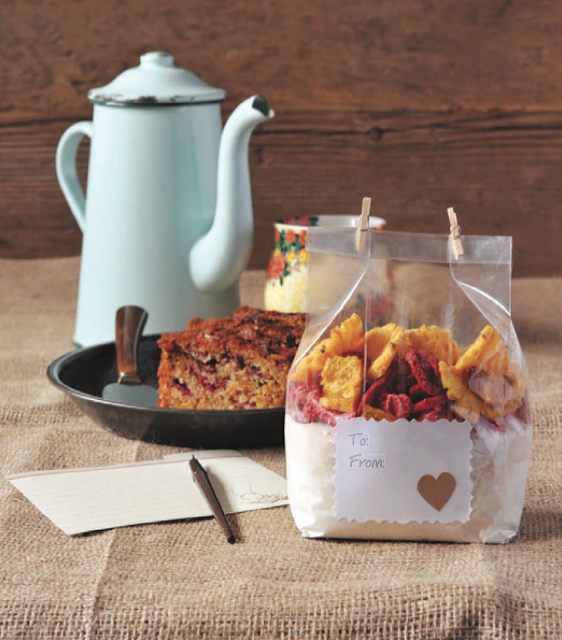 What a great idea, the baking mix with freeze dried fruit! Thanks for sharing. And I'm swooning a little that Kurt Halsey did your artwork on the card. I have gifted his prints before, such amazing stuff. I have never tried freeze dried fruits or veggies before, unless you count the freeze dried strawberries that are in the Special K with Red Berries cereal. i tried dried fruits, and i like them just as a snack. have never tried dried veggies before though. I don't think I have tried freeze dried fruits and/or veggies before! I have tried freeze dried fruit. I like it in my cereal! Kurt did all of the illustrations in this book! He is indeed a talented and lovely man.